The Reform Bahai Faith affirms the universal spiritual and moral principles taught in all of the great religious traditions. Similar to Mahayana Buddhism and the Buddha's Example of compassion, Reform Bahais believe the Example set by Abdul-Baha during his travels to Europe and the United States in the early 20th century, an Example of universal love and brotherhood, was perhaps his greatest teaching. As Abdul-Baha often suggested, far from having the exclusive truth and the fanaticism to which that notion has so often led, Reform Bahais look to what is universal and non-creedal in the world's religious experience, and include prayers and meditations from other religions in their private and community worship, listen to and learn from God's other religions—all of which is to say the Reform Bahai Faith has moved on from its historical and cultural roots, as all living religions have and do, and is now a global, universal faith. Abdul-Baha taught that the Bahai Movement was a way for people of all religious persuasions to come together in neutral territory and worship the Divine Being in a mutually respectful atmosphere of peace and harmony. Speaking in England, he said, "You can be a Bahai-Christian, a Bahai-Freemason, a Bahai-Jew, a Bahai-Muhammadan." Reform Bahais believe Abdul-Baha's Interpretation for the modern world of his father Baha’u’llah’s Teachings is much more profound than the prevailing conception of religion. Speaking in Europe and North America from 1911 to 1913, Abdul-Baha stated on a number of occasions that he was a man just like anyone else and that the Bahai Faith could not be organized, yet often spoke paradoxically of the growth of the Bahai community throughout the world, grounded in democratic pluralism. Known during Abdul-Baha's time as the Bahai Movement or Cause, the Reform Bahai Faith is not an organization, but a way of life. More "Protestant" along the lines, in some ways, of Unitarian Universalism or more open interpretations of Sufism, or other similarly liberal denominations, Reform Bahais believe it's largely the responsibility of the individual to read the Bahai Writings and prayerfully decide, prayerfully discern, how to follow the spiritual message of Baha'u'llah, Founder of the Bahai Faith, and those of Abdul-Baha, the Interpreter of Baha'u'llah's Covenant, striving for spiritual development and service to humankind. God has created the individual soul to develop in the integrity and freedom of his or her own search for spiritual maturity and conscience, through prayer and meditation, transforming the community and the world one soul at a time, achieving the timeless goal of self-sacrificing love, compassion, and service to humanity. In practice, there are individual Reform Bahais who follow all or many commonly shared Bahai forms and teachings observed by other Baha'i denominations because they themselves believe they should or want to; not because they're pressured into them. There are other Reform Bahais who don't feel comfortable with one thing or another, believing perhaps the time is not right for themselves and others, or the particular teaching may be more culturally bound to the past than the more universal principles of Baha'u'llah. Reform Bahais follow Abdul-Baha's 1912 Authentic Covenant, which he delivered publicly in New York City, a broad, open, loving vision of God's relation to humanity. While emphasizing what is universal in humanity’s religious experience, Baha’u’llah taught the changing, evolutionary, and progressive nature of religious truth, demonstrating it by his own example and teaching which evolved away from much of the teaching of his forerunner the Bab. Similarly, Abdul-Baha demonstrated essentially a re-Interpretation of Baha’u’llah’s teachings for the modern world. 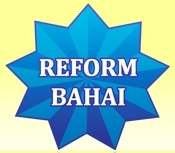 Reform Bahais do not regard the Bahai message as a rigid set of unchanging and inflexible doctrines and formulas. Nor is the universality of the Bahai vision frozen in a form subordinate to the exclusivism of the Judeo-Christian or Islamic and Sufi cultural heritage of the Bahai Faith. The universal, global Teachings of Baha'u'llah transcend the limitations of all past Dispensations, inspire and envision a new spiritual worldview and civilization. Baha’u’llah and Abdul-Baha taught that it is the Spirit that is important, not form, doctrine, or organization. Accordingly, God is interested in the human heart, sincere worship, communion, and prayer, the individual cultivating the virtues of the spirit in selfless service to humanity, in practice and deed, not merely doctrine and theory, in every walk of life, respecting the unique cultures of the earth, even while revering what’s universal or held in common by humankind. Abdul-Baha envisioned the Bahai House of Worship as open to the faithful of all religions and traditions, as a place of universal prayer and meditation, not exclusively Bahai. Consequently, Reform Bahais honor the spirit wherever it is found and expressed in the writings and oral traditions of wisdom and belief. Following Abdul-Baha, Reform Bahais elect Spiritual Assemblies, with nine members, for community consultation and guidance. Largely "congregational" in structure, local communities are independent grass-root associations, though they can ultimately elect national and an international unit with non-binding advisory and coordinating duties and responsibilities. While Abdul-Baha stated he had not "appointed" anyone to succeed him, he did not mean that the local, democratically elected assembly could not appoint people to serve in any position necessary, "to engage in service of the Kingdom." At every level of Bahai consultation, the independence and integrity of the individual is preserved. Reform Bahais believe Baha'u'llah taught that the separation of church and state is the Will of God and distance themselves from any interpretation of an eventual Bahai theocracy, following Abdul-Baha's vision of a global spiritual democracy, enriched by pluralism. At the deepest level Bahai universality understands its own claim to spiritual truth to critique itself and open to and merge with every breath from heaven. See About Baha'u'llah for further historical details. Copyrighted 2004-2018. All Rights Reserved.